The 6.5 Grendel is quickly showing its capabilities as a tack driving, flat shooting, long range round without the cost and bulk of heavier rounds. This Steel cased, Berdan primed load by Wolf, makes the cost drop even further while the performance remains. This 100 grain FMJ round pushes 2620 feet per second out of the muzzle and delivers 1524 ft. lbs. of energy at exit. 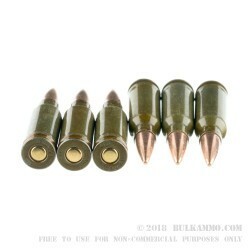 Being Berdan primed offers excellent ignition consistency but makes it much more difficult to reload; paired with the steel casing it's not practical to try to reload this round, but it is offered at a significantly discounted price point which makes it a great all around box to stock on your ammo shelf. The ball ammo is still a very effective varmint and small game round out to excellent distances, and the load offers very good price for range days. 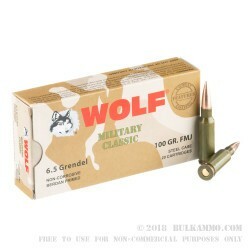 Wolf Ammunition (the producer of this Wolf Military Classics load) is based in Russia. It's manufacturing process involves coating the steel cases in a special coating which has proven to be reliable in loading and extraction in military firearms and commercial civilian weapons alike. Packaged as 20 rounds per box; 25 boxes. Q: Can you ship 6.5 grendel 500 rds legally in california? I mean is it legal to ship to California? 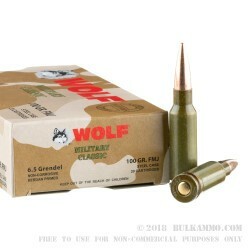 A: This ammo like so much of the Wolf brand will not pass a magnet test. The jacket is bi-metal, meaning it has several very thin layers of copper and steel wrapped around the lead core. For range safe ammo you will want brass cased. Q: Is this the correct ammo for the M94 Swedish Carbine? A: Your Swedish M94 is most likely chambered for the 6.5X55 Swedish Mauser cartridge. If in doubt, and especially if this an older firearm you have not shot, please have it checked out by a reputable gunsmith. Q: I live in California. Lots of rules and regulations. 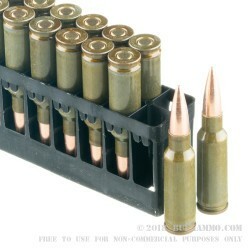 I am interested in the 500 round pack of Grendel 6.5 ammo. Need to know if it will stick to a magnet. Not allowed to use metal that sticks to a magnet at our range. A: Hello Mike, This ammunition is loaded with a lead core, bi-metal jacketed bullet. Due to the steel content of the jacket, this ammunition will not pass any type of magnet test.